The location was pretty good: the apartment is a walking distance from the beaches. The pool was nice too. Our room had a full size fridge and a cooking stove and the oven. 3 minute walk (short cut) to the Marriott beach front, or 7-8 minute walk on the street. The lovely lady who runs the resort is so helpful and gracious. Property is exceptionally clean and well cared for. The location is 5min walk to the beach and fisherman's Hut. It was ideal for my Kitesurfing vacation. The studios are cute, clean with lots of flowers and green plants. Plenty of barbeque and kitchen area to cook. The BEST part about staying here is ISABEL and her family. Thank you for everything Isabel and for your hospitality. My studio was great for a solo traveler as I was kiting all day long. AC is cold, room clean and all around great place. Excellent location. Arashi Beach much closer than appears on map (nice leisurely walk). Isobel was wonderful! Pool was nice. 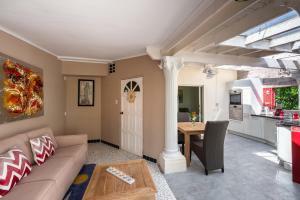 Very nice villa with few rooms if different configurations .5-7 min walk to the beach . Located in the redontial Area , very safe . Housekeeper Isabel is very very nice and will be able to assist you with what you need. she can make breakfast fir your fir addditinal minimal Cost . Mosquitoes were a problem for me , bring then spray . No hot water presently in the shower , but still able to take a showers with luke warm water ... overall is very well positioned property for the money and you don’t feel in the overly touristic area . Recommended ! The bed was fantastic! I slept wonderfully every night. The location was perfect for me - away from the noise and hustle & bustle of the tourists, yet a quick little walk to the beautiful beach. I can's say enough about the hostess and her staff, and Edna the resident on site. They were so welcoming and accommodating, they made me feel like part of the family - even inviting me out to dinner at one of their favorite local restaurants my last night. It was lovely to have coffee with the hostess and other guests in the morning and to be able to relax by the pool. It was very clean with fresh towels and bedding every other day which is plenty. I was also able to borrow snorkeling gear which worked perfectly, for an incredible day of discovery. This saved me money which I appreciate. Once on the island, I found I could have found accommodations with a bit more luxury for the a similar rate, but highly doubt I would have enjoyed the company as much. Alejandro and his wife were wonderful at managing the property and cooking a great breakfast. Reinke, the owner, was very friendly and proud of her property (and so should she!). Very accommodating, clean, charming, home away from home. The property owner and family was the best!! It was my wife's birthday and when we woke up that day she decorated the outside of our apartment. It was so nice. They gave us cake on Valentine's day it was good. You can come and go as you please at anytime no one bothers you and you can sleep as late as you want. The place was well kept and you have your own kitchen plus a grill in the back yard it was amazing. Lock in a great price for Sunflower Villa Studios – rated 9 by recent guests! One of our top picks in Eagle Beach.Offering free WiFi and a garden, Sunflower Villa Studios is located in Noord, just 1,300 feet from Palm Beach and 2.7 mi from Eagle Beach. 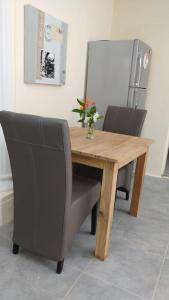 The accommodations comes with a seating and dining area. 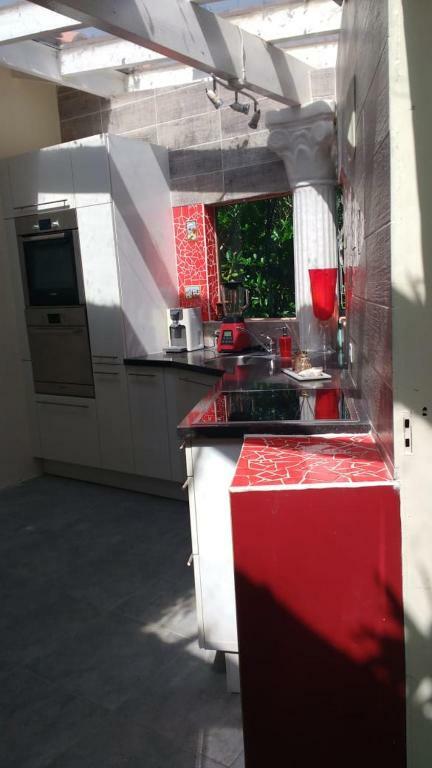 There is also a kitchenette, equipped with a microwave, refrigerator and stovetop. There is a private bathroom with a shower in every unit. Bed linen is featured. Sunflower Villa Studios also includes a high pressure tub and outdoor pool. Car hire is available at the property and the area is popular for snorkeling. 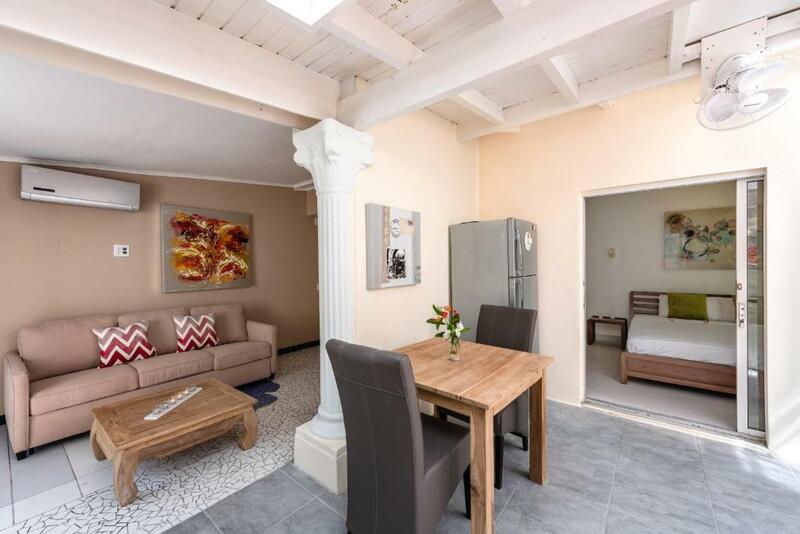 Oranjestad is 4.3 mi from Sunflower Villa Studios. 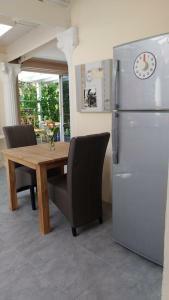 The nearest airport is Queen Beatrix Airport, 5.6 mi from Sunflower Villa Studios. 뀐 Located in the top-rated area in Palm-Eagle Beach, this property has an excellent location score of 9.1! When would you like to stay at Sunflower Villa Studios? 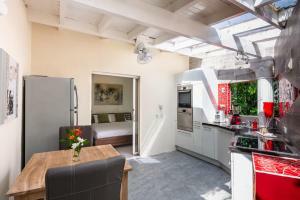 This studio has a private entrance, stovetop, kitchenette and dining area. This studio has a seating area, air conditioning, kitchenette and dining area. This apartment features a microwave, seating area, kitchenette and dining area. This studio has a stovetop, kitchenette and air conditioning. 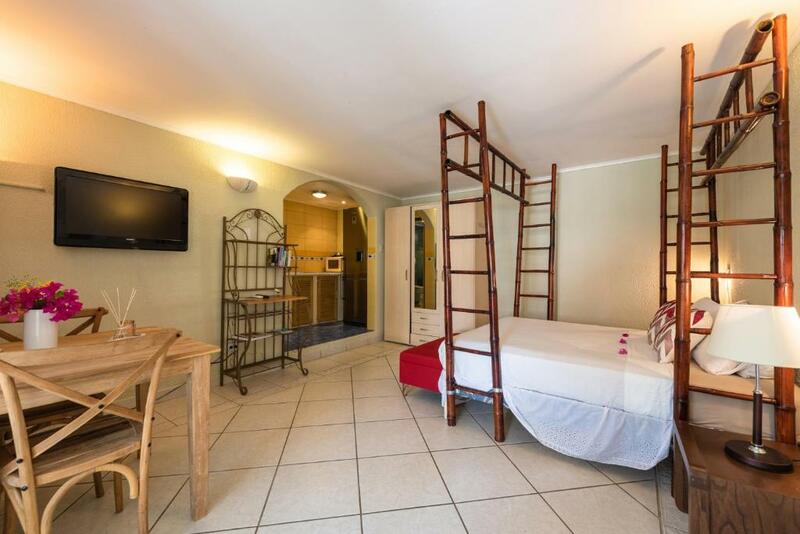 This air-conditioned studio has a private entrance, seating area, kitchenette and microwave. This studio has a seating area, air conditioning and a kitchenette. 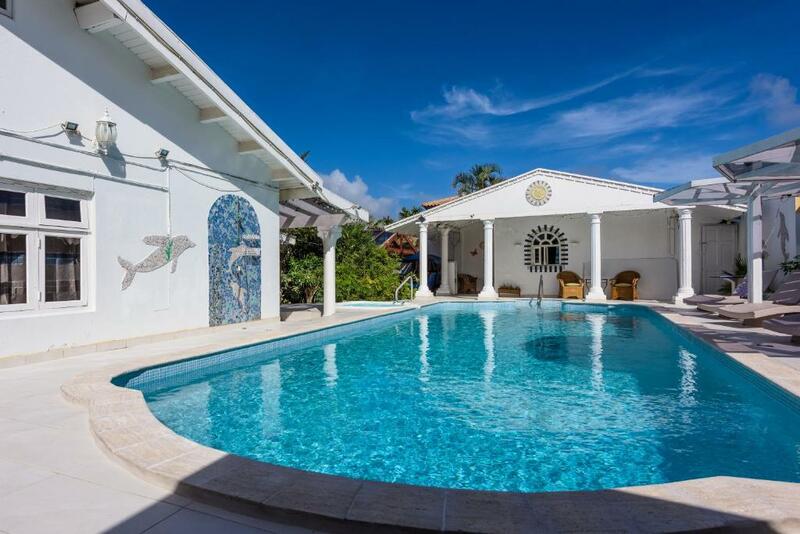 The Villa is in one of the best areas of Aruba, very quiet and walking distance to Palm Beach is only 450 yards. Every room has a special color and is different. All rooms have their own private terrace, privacy is very important. Every unit has a fully equipped kitchenette and there is an extra outdoor covered kitchen in the garden to enjoy any time of a good BBQ! Isabel is ready & excited to welcome you at Sunflower Villa! Our Team has been providing our guests with memorable vacation experiences. One of the biggest benefits of our neighborhood is that we are very close to the most touristic and attractive areas of the island. Windsurfing and other attractions are 10 min walking distance from us. Also other tourist attractions like e.g. the best shopping malls, nightclubs and restaurants are very close by. House Rules Sunflower Villa Studios takes special requests – add in the next step! Sunflower Villa Studios accepts these cards and reserves the right to temporarily hold an amount prior to arrival. Please inform Sunflower Villa Studios of your expected arrival time in advance. You can use the Special Requests box when booking, or contact the property directly using the contact details in your confirmation. Amazing location very close to the most beautiful beach ,Palm Beach .The staff offered a better stay as they had availability,villa is clean and tidy all day around .The spot lights spread and makes it like a fairy tale during the evenings if you have any plans to cool down from the heat or busy tourist places,plenty of relaxation areas near the pool as well,water is daily cleaned . Sunflower Villa is in a quiet and relaxing area but near Palm Beach (10 min walk), beautiful and clean apartament, Alejandro is very kindly and friendly! Coffee and the it’s free, beautiful swimming pool. About the car rentals ask to Alejandro, he help you with a good price rental. 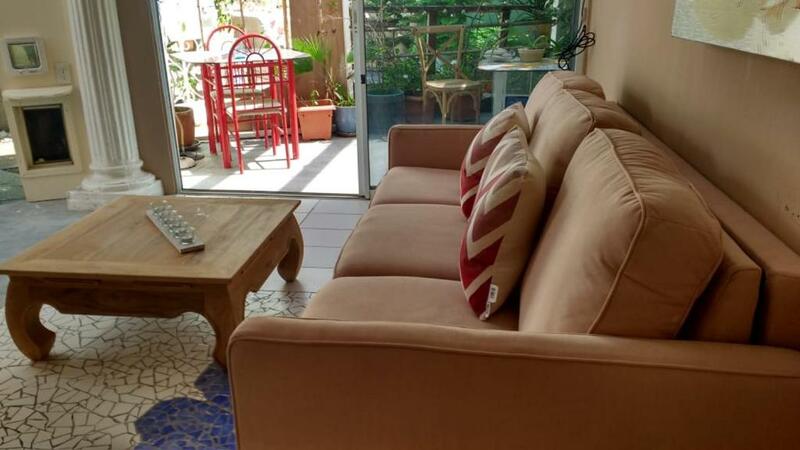 The Sunflower Villa Studios is an absolutely fabulous place, a tranquil oasis a few minutes walk from Palm Beach high rise hotels. We could not have been made more welcome than we were here, the studios are spotless, the pool and terrace a restful place to relax after a day at the beach or sightseeing. The outdoor areas with the pool and kitchen was amazing. Locaded close to the beach (5 minutt walk) and a local supermarked. The hostes were adorable and very friendly. Location was great! walking distance to the beaches. Loved the beautiful tile artwork that graced the tables, walls, sidewalks! Very comfortable. Hosts very friendly! like home away from home. All was to my liking. The Sunflower Villa is a gem of a place located within a 10 minute walk to spectacular beaches and many restaurants. The proprietors are friendly, welcoming and accommodating. My room was comfortable and provided for my needs. The pool area grand with comfortable loungers. I hope to return next year. There was no hot water in the room so we had to take warm showers which was the temperature of the ocean water. Our toilet started overflowing and the lock on the door broke so we couldn’t lock our room. When we took a shower, the whole bathroom floor was covered with water because of the way the shower cabin was built . The service were friendly and nice.